You have two connected objects and you want users to use only one form to either create a new connected record or edit the existing connected record. For example, you may want your users to be able to add a new Sales Rep to a Lead that doesn’t have one or edit the existing Sales Rep connected to a Lead, from the same form. The connected objects must have a many-to-one or one-to-one relationship. The form can must be added for the “to-one” or parent object in the relationship. In this example, many Leads connect to one Sales Rep. 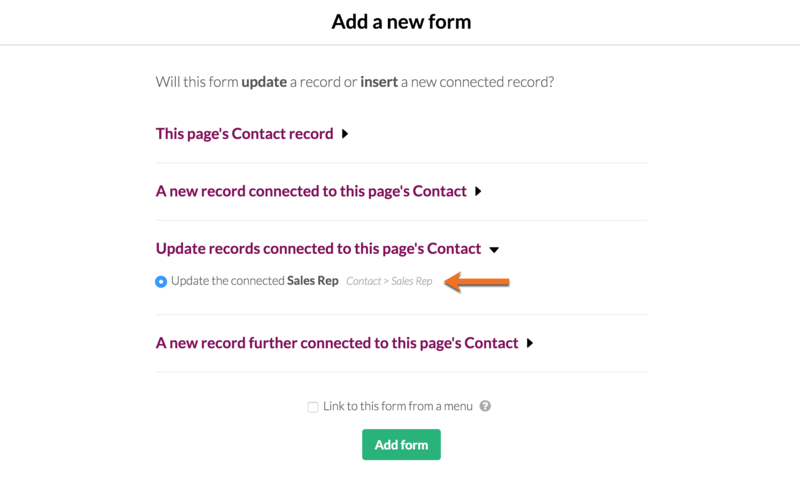 So the form can be created to add or edit the one Sales Rep connected to a Lead. In the Pages section of the builder, create a new Details page for Leads. If you’re not sure how to create a details page, this article will walk you through the steps. Click the “eye” icon in the top right corner and navigate to the page with your Leads view. Click to view the details for a Lead that has no Sales Rep connected to it. Fill out the form you created in step one and click the Submit button. Refresh the page and see your new Sales Rep connected to that Lead. You can then edit the Sales Rep you just created from the same form.